Madeline C. Koperski died peacefully at home January 28, 2019, surrounded by her loving family (and her two cherished dogs). She was 74 years old. Madeline was born April 13, 1944, in Detroit, to Dorothy (nee Cass) and John Barra. A woman of great faith, Madeline consistently reminded her family to choose prayer over worry. She truly believed that God only gives us what we can handle, and she lived her life accordingly. She was a very disciplined and determined person, but also gentle and loving; she believed kindness was to be shown to everyone, including strangers. She was a devoted wife and mother who adored her husband, children, and grandchildren. She cherished lunch dates at Macy’s with her daughters, and never turned down a family outing to the casino. 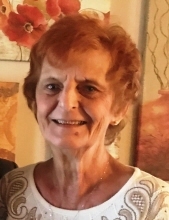 A lifelong learner, Madeline was an avid reader who always encouraged her loved ones to learn from everything life offered, even its most painful and challenging events. She looked forward to the Spring, her favorite season of the year, as it represents new life and new possibilities. A loving wife, devoted mother, proud grandmother, and cherished sister, Madeline Koperski was deeply loved and will be sorely missed by all. She is survived by her beloved husband of 56 years, Arthur Koperski, her children, Kathryn Koperski, Mary Beth Spicer, John Koperski, and Jennifer (Randy) Maddock. She is also survived by her grandchildren, Laura (Kevin) Robinson, Kayla, Jake, and Luke Spicer, and Ryan and Joey Maddock, as well as her sisters, Maria (Jim) Houle and Charlene (Norbert) Tralka. Madeline was preceded in death by her daughter, Karen Marie, and her sister, Patricia Battiatta. Visitation will take place at Lynch & Sons Funeral Home, 1368 N. Crooks Road (between 14-15 Mile Roads), Clawson, Thursday, January 31, 3-8pm with Prayers at 3pm. A Funeral Mass will be celebrated at Guardian Angels Catholic Church, 581 E. 14 Mile Road, Clawson, Friday, February 1, at 11am. Friends may visit at church beginning at 10:30am. Memorials appreciated to the American Lung Association or the National Kidney Foundation Prescription Fund. "Email Address" would like to share the life celebration of Madeline C. Koperski. Click on the "link" to go to share a favorite memory or leave a condolence message for the family.